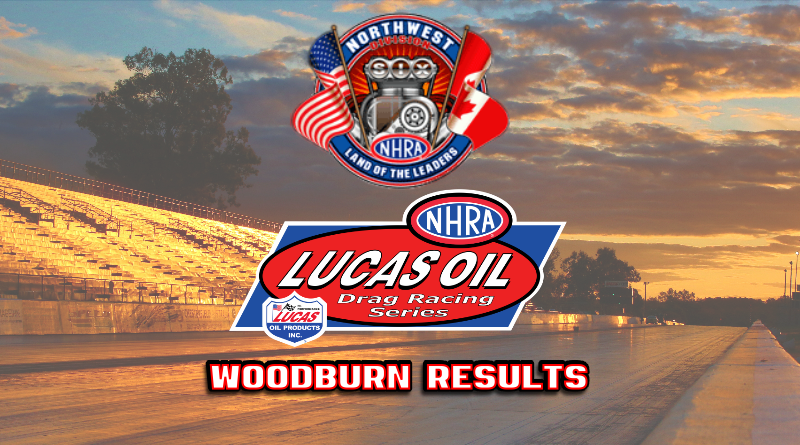 WOODBURN, Ore. – In the final results from Woodburn Dragstrip and the NHRA Lucas Oil Drag Racing Series Kim Parker closed the deal in Top Alcohol Dragster for her first Lucas Oil Series win while Brian Hough collected his 18th in Top Alcohol Funny Car. Parker defeated Garrett Bateman and Casey Grisel in rounds one and two for the right to race No. 1 qualifier Shawn Cowie in the final. Parker, Graham, Wash., saved her best run of eliminations in a 5.239 second, 275.90 mph lap to defeat Cowie who slowed to a 5.582, 195.27 for his runner up finish. Hough, Junction City, Ore., just out powered Doug Gordon of Paso Robles, Calif., in a great final round with Hough covering the quarter-mile in 5.513 at 268.17 to Gordon’s 5.591, 268.17. Hough downed Tyson Parker and reigning NHRA World Champion Shane Westerfield in early rounds. Jeff Lane, Jody Lang and Justin Lamb each added to their already impressive win column with Lane, North Bend, Wash., picking up his 58th win on the divisional level in taking out Todd Miller, Fairview, Ore., in Comp Eliminator. Lang, Puyallup, Wash., checked off divisional win number 49 in defeating John Whitmore in Super Stock and Stock World Champion Lamb, Henderson, Nev., bagged his 25th win as Darrick Ellam broke out in Stock. Evan Kowalski, Dave Senio and Miles Hauer each visited the winner’s circle for the first time in their career. Kowalski, Riverside, Calif., parlayed a .006 reaction time into the win over Garett Colletti, Snohomish, Wash., and Senio, Rolly View, Alb., CAN, won on a double breakout with Yeshua Wilcox, Bonney Lake, Wash., in the RAD Top Dragster. Senio posted a 7.095, 188.63 mph lap to Wilcox’s 7.104, 187.73. Hauer, Seattle, was quicker out of the gate in Sportsman Motorcycle combined with a 7.997 second, 157.34 mph run to end Bob Osborne, Dallas, Ore., day. Rounding out the winner’ circle celebration were Phil Gilbert in Super Gas over John Dalrymple; Lloyd Flatum beat Greg Ventura in Super Street; and Shawn Herbst defeated Don Sefton in JBS Top Sportsman. Jeff Lane, North Bend, Wash., ’10 Cobalt, A/SMA, 7.961, 145.58 def. Todd Miller, Fairview, Ore., ’23 Ford T, AA/AM, 6.902, 180.79. Jody Lang, Puyallup, Wash., ’81 Malibu, GT/NA, 10.762, 121.53 def. John Whitmore, Myrtle Creek, Ore., ’95 Achieva, GT/IA, 9.853, 124.41. Justin Lamb, Henderson, Nev., ’18 Camaro, FS/D, 9.656, 126.12 def. Darrick Ellam, Ridgefeild, Wash., ’76 Pinto, W/SA, 16.355, 79.92. Evan Kowalski, Riverside, Calif., ’09 Danny Nelson, 8.933, 157.78 def. Garett Colletti, Snohomish, Wash., ’02 Undercover, 8.883, 168.25. Phil Gilbert, Clackamas, Ore., ’98 Firebird, 9.903, 173.17 def. John Dalrymple, Sunnyside, Wash., ’04 Corvette, foul. Lloyd Flatum, Lynnwood, Wash., ’68 Camaro, 10.890, 142.51 def. Greg Ventura, Corona, Calif., ’66 Nova, 10.884, 142.00. Shawn Herbst, Selah, Wash., ’68 Firebird, 7.047, 196.12 def. Don Sefton, Port Orchard, Wash., ’09 GXP, foul. Dave Senio, Rolly View, Alb., ’08 TNT, 7.095, 188.63 def. Yeshua Wilcox, Bonney Lake, Wash., ’05 Undercover, 7.104, 187.73. Miles Hauer, Seattle, ’04 Suzuki, 7.997, 157.34 def. Bob Osborne, Dallas, Ore., ’98 Buell, 10.629, 122.68. Drag Champ is the online source for NHRA sportsman class racing news and results. Visit DragChamp.com daily to stay informed of all the sportsman racing news.